70% of your donation always goes directly to our artists! ATB is producing a series of multi-disciplinary artistic Happenings at the Dorchester Art Project. Come to one, or come to them all! We’ve assembled a crew of vibrant artists to celebrate our return to the theatre scene with a series of art-focused events, all located hosted at one of the coolest arts spaces in town. Featuring: Dancelujah and Ashni Dave, w/ special slam guest Ashley Rose. Party with ATB at our first ever Summer Happening! heart/soul is an evening of music, poetry, and art with a funky vibe. Come boogie with Ashni and Dancelujah, and enjoy Ashley Rose’s celebrated slam poetry. Free summery snacks will be provided, with additional food and drink for sale. Plus, tune in for a Very Special Announcement live at our Happenings launch. Featuring: Chop, a new play by Stephanie K Brownell. Poetry by Erin Lerch, Sara Daniele Rivera, and more. Art by Natalie Good, Grace Trapnell, Stephanie K Brownell, and Sara Daniele Rivera. Come and reflect with ATB at our second Summer Happening! F*T is an evening of theatre, poetry, and art all centered around bodies and their relationship to food. We’ll be providing free summery snacks with extra food and drink for sale. Plus! Our artists will be offering special, exclusive, amazing on-the-spot portraiture. Featuring: Big Fuzzy, Stace Brandt, Sam Talmadge, and Donna + Julia. Art by Eva Okrent. At our final Summer Happening, we’re chilling out and getting down! pop up/cool down is an evening of music and art with a laid back, twisted vibe. We’ll be providing free summery snacks with extra food and drink for sale. to combat the horrific treatment of undocumented folks at the border and beyond. 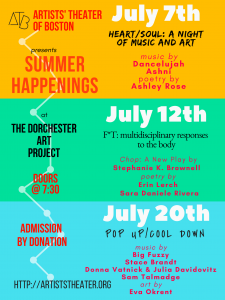 The Dorchester Art Project is located at 1486 Dorchester Ave, Boston, MA 02122, a five minute walk from the Field’s Corner stop on the Ashmont branch of the Red Line. Each Happening is a suggested donation of $10 at the door, or $8 online in advance. If you buy tickets for all three in advance, you get all three shows for only $20!